Writing left-handed: what's the challenge? View our YouTube video about the Swanneck Pen. Fact: left-handers suffer more using standard pens designed for right handers than they do using any other right-handed tool. A left hand immediately obscures the letters and words just written - making it hard for the writer to keep track, especially when it's a child learning to write. A left-handed writer can easily smudge ballpoint, roller ball, felt tip and other inks - making a mess of school work, letters and other important documents. "Recent Left-handers Club research among 1000 left-handers shows that 99% of those surveyed have experienced difficulty with their writing". 'The Fist' - clutches pen in whole fist, obscuring most of what is written. 'The Hook Style' - tries hard to see what he or she is writing by tilting the paper to the left. If not dealt with early, the hooking problem can make a left hander's writing both slow and hard to read. ''The Overwriter' - writes following a steep rising line from left to right, sometimes at a full 90 degrees to the body. The Underwriter' - tilts the paper to the left, adopting a downward sloping writing line. Letters and words then tend to lean annoyingly forward. Many children learning to write left-handed find themselves embarrassed and discouraged - just at a time when they need all the confidence they can get. Left-handed writers often find themselves forced to tilt the paper at all kinds of awkward angles - contributing to illegible 'sloping' styles, calluses, even muscular pain. A common issue for young left handers - who frequently confuse lowercase d's and b's, as well as their p's and q's. Swanneck Pens represent a revolution in left-handed ballpoint pen design that's not only ergonomic, it looks great too. 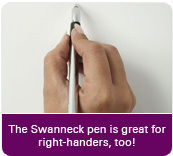 Extensive trials show that our easy-to-hold Swanneck profile generates nothing but a positive response, both from children and older writers who've long been frustrated by conventional right-handed pens. You can now buy Swanneck Pens here! It's great for right-handers too! Swanneck Pens are also ideal for right handers needing to write 'right to left' - for example in Arabic or Asian languages. Our simple but intelligent design solves 'cover up', speed, smudging and posture problems for 'right to left' writers just as effectively.